Many people want to know how to make better use of their time when they partake of a regular exercise program. Ok, you paid for your gym membership and you only have a certain amount of time to work out. Obviously, you are there to make improvements in your body and your health, right? So how are you going to make the best use of your time? Before you consider going to the gym to exercise, make sure you are familiar with the equipment and the program you will be following. It may be a good idea to have an orientation, fitness test and some lessons regarding gym equipment use, exercise technique, and program design. It would also be quite important for you to understand the degree of time you have to invest in yourself and develop your schedule around your exercise time. Most people fit in their exercise time with their other responsibilities. You may want to re-think this strategy. When you have a time selected, for example one hour on Monday, Wednesday and Friday, are you counting traveling time, changing and showering? In my opinion, allow at least 60 full minutes for a workout each session. Part of your planning should be what you intend to eat and drink prior to your workout. Depending upon when you go to the gym, you should have eaten at least 30-45 minutes before your workout. Your meal can be a lean protein, complex carbohydrate combination consumed every three to four hours throughout the day. You do not need to eat or drink a special meal before a workout. Adequate hydration throughout the day is necessary, however, and can take the form of plain old water. If you want to drink some coffee before a workout, it’s probably a good idea, but don’t expect that this will make you superhuman. Do not go to the gym hungry, tired, or sick. Your body will not respond or benefit from this wasted effort. As you drive to the gym, do some mental preparation so you can get psyched. Do not underestimate the power of your mind to influence your body! When you are in the gym, you should know what you are going to do that day as you will have a program. I’m gaining an understanding of the equipment and how to use it correctly. 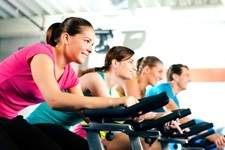 After your warm up of 20 minutes of moderately-paced cardio on a machine, you can progress to your resistance training. If you are performing a circuit routine, perform 12-15 repetitions at each station. The amount of weight you lift should equate to 50% of your maximum lift. This can be raised to 60% when you are ready. Proceed from one station to the next with NO rest. Each station should focus upon a separate body part. If your heart rate or level of perceived exertion does not increase as you move through the circuit, you are not working hard enough! It is important that you practice a correct breathing technique and focus upon the muscle group you are stressing, not the machine itself! After your circuit, jump back on the cardio equipment for another 20 minutes. When you get in better shape, repeat the circuit two to three times. If it gets too easy, add weight, add more exercises, add different exercises and try different and demanding cardio machines. To be successful in the gym, you must push yourself and be prepared to change things around as you progress. Take water with you and sip it when you need it. The most important things you can do after a workout are to eat a good meal and then rest. A good meal could be a lean protein like chicken breast, fish, lowfat cottage cheese, or Greek yogurt combined with a whole grain, vegetables, fruits, and some nuts. Most people really don’t require special food supplements after a workout unless they are a lot more advanced. You also need to rest, and this is a very big issue that people often forget as all the adaptations which occurred in the gym for your body occur during the rest after a workout. Adequate sleep, lower degrees of stress, and a reasonable work-life balance will always help you in with this process. Hart, M.,“What to Do Pre- and Post-Workout,” Sept 9, 2013;http://www.huffingtonpost.ca/dr-mike-hart/workout-tips_b_3641947.html, last accessed Sept 9, 2013.